Has the pixel to print tipping point been reached? Last July we reported that Amazon’s Kindle eReader books had surpassed hardcover books in terms of sales, selling 143 Kindle books for every 100 hardcover books. Now that lead also holds for paperbacks as well with 115 Kindle books being sold for every hundred paperbacks. The statistic for hardcover books itself has doubled, with three times as many Kindle books as sold as paperbacks in 2010. Free Kindle books are excluded from this number or it would be much higher. 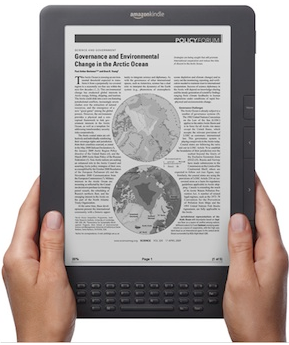 The Kindle store now has over 810,000 books, with over 670,000 of them priced at $9.99 or less. This number includes 107 New York Times bestselllers. Because of its aggressive focus on digital Amazon had its first ever $10 billion quarter. Amazon CEO Jeff Bezos predicted this digital to print milestone would happen in the second quarter of this year, so it has come ahead of expectations but, in any case, was inevitable.